From Maple Creek to Prince Albert, from Moose Jaw to Saskatoon to Regina, the need for reliable heating and cooling remains the same in all of Saskatchewan. If you live anywhere in Saskatchewan and find yourself in need of an air conditioner or furnace that will hold up in the face of the hottest summers and the longest winters we have a great option for you. Most people think they have to purchase an HVAC appliance and pay high upfront prices but we are here to let as many people in Saskatchewan know as possible that there is another way. By renting your air conditioner or furnace from us you stand to reap the benefits of an unparalleled and highly consumer-oriented program. We have cultivated our rental program based on the concerns, wants and needs of the residents of Saskatchewan. This means among other things that renting from us will save you time, stress and most importantly money. You may have even heard of other HVAC rentals but what sets us apart from the competition is that we make it beneficial for you to replace your old unit even if it is still in good working condition. You are probably thinking that most rental programs will only help you out if your furnace or air conditioner is on its last leg but that is not the case with us. By upgrading your old appliance today through our rental service you stand to save a ton of money right away and help reduce your environmental impact, depending on how old and inefficient your current unit it. Think of it kind of like refinancing your home for a lower rate. 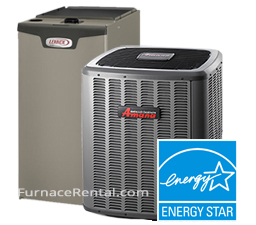 By replacing your old inefficient furnace or AC with one of our ENERGY STAR certified models from top brands like Amana and Goodman, you are reducing the money you spend on your monthly utility bills. Speedy Installation – The cold and heat do not wait and neither do we. In many situations we are able to install the unit of your choice the day after you speak with us. Just choose a day that works best for you and our certified technicians will be able to handle the whole of the installation in a matter of hours. Top Notch Customer Service – Just because you need heating or cooling immediately after your old appliance has broken down you shouldn’t make a hasty decision. Our techs are on call for you and will help you quickly and decisively choose a unit that is suited superbly for the heating and cooling needs of your Regina, Saskatoon, Estevan, Weyburn, or Melfort home. Emergency Service Calls – You can count on us 24 hours a day, 7 days a week and 365 days a year to come to your aid. Emergency service calls are free when you rent with us. Complementary Annual Maintenance – We know that HVAC appliances should be looked at and tuned up at least once a year so we include a free annual maintenance call no matter what condition your unit is in with our rental packages. Finally we want you to know that there is no need to be timid about contacting us because you have less than perfect credit. We have an flexible approval for homeowners. Breakdown of heating and cooling units tend to happen at the most inopportune times. Repair costs of older units can be tremendously expensive and upgrading with us will guarantee years of reliable usage with no fear of incurring repair costs. In essence it is at least a good idea to look into upgrading your HVAC appliance. We are certain that we will be able to pair you with a unit that will not only provide efficient, sufficient and even heating and cooling for your Saskatchewan home but save you money as well.